240 pages | 2 B/W Illus. How do emerging states obtain international recognition and secure membership of international organisations in contemporary world politics? This book provides the first in-depth study of Kosovo’s diplomatic approach to becoming a sovereign state by obtaining international recognition and securing membership of international organisations. Analysing the everyday diplomatic discourses, performances, and entanglements, this book contends that state-becoming is not wholly determined by systemic factors, normative institutions, or the preferences of great powers; the diplomatic agency of the fledgling state plays a far more important role than is generally acknowledged. Drawing on institutional ethnographic research and first-hand observations, this book argues that Kosovo’s diplomatic success in consolidating its sovereign statehood has been the situational assemblage of multiple discourses, practiced through a broad variety of performative actions, and shaped by a complex entanglement with global assemblages of norms, actors, relations, and events. Accordingly, this book contributes to expanding our understanding of the everyday diplomatic agency of emerging states and the changing norms, politics, and practices regarding the diplomatic recognition of states and their admission to international society. "This timely study captures the discourse and practice of Kosovo’s foreign policy during its critical first decade of independent statehood. Gëzim Visoka’s detailed and insightful analysis offers a masterful account of the contemporary challenges facing new states in the international system" – Dr Enver Hoxhaj, Former Minister of Foreign Affairs of Kosovo. "In this engaging and timely book Gëzim Visoka shines much needed new light on the contested process of international recognition. Through an empirically rich analysis of Kosovo’s diplomatic discourses, practices and entanglements, Visoka addresses crucial questions around how emerging states seek to carve out a meaningful existence within contemporary world politics. He does so by developing a conceptually nuanced and insightful perspective that turns critical attention to the everyday construction of sovereignty and statehood, the oft-neglected role of diplomatic agency, and how political legitimacy is fostered by the actions of contested states." - Fiona McConnell, University of Oxford. "Visoka musters insights from Social Anthropology and International Relations to lay bare the myriad of practices that informed Kosovo’s diplomatic strategy to act like a state and join the international community. Generalisable insights are on ample display." - Iver B. Neumann, Norwegian Social Research (NOVA). 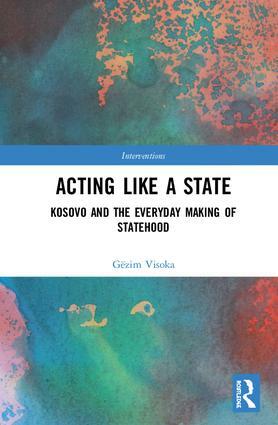 "In this important and innovative book, Gëzim Visoka explores the everyday politics of constructing independent statehood and obtaining international recognition. The rich empirical analysis of Kosovo’s diplomatic efforts shows convincingly that such agency matters: international recognition does not simply depend on international norms or great power politics. The book makes an original and significant contribution to the existing literature and is a must-read for anyone interested in state recognition." - Nina Caspersen, University of York, UK. Gëzim Visoka is Assistant Professor of Peace and Conflict Studies at Dublin City University, Ireland. He is author of several books and numerous journal articles on international intervention, peacebuilding, foreign policy, and state recognition.